Share the post "Dept. of Agricultural, Food and Resource Economics Celebrates 100th Anniversary"
DAFRE graduate alumni, along with Distinguished Professor Carl Pray. Front row, left to right: Karen Rose-Tank, Margaret Brennan-Tonetta, Liping Wang, Julia Menzo, and Ann Courtmanche. Back row, left to right: Brian Schilling, Carl Pray, Katrin Glode-Sethna, and John Italia. One day after an on-campus event celebrating the 150th anniversary of Rutgers’ designation as New Jersey’s land grant institution, an important component of that institution – the Department of Agricultural, Food, and Resource Economics – marked its founding exactly fifty years later, in 1914. The department’s centennial event, held on November 6th in the Cook Campus Center, featured a panel discussion on “Agricultural and Resource Economics in the 21st Century.” This was followed by a reception and dinner for alumni, current and former faculty, staff and guests. The economists, of course, aggregated their production cost data from multiple operations. These data would come in especially handy in the 1930s, when the federal government had to figure out how to set price ceilings for agricultural commodities without bankrupting producers. While the economics of agricultural production dominated the early years, Gottlieb said, research moved gradually from “farm gate” to “plate,” a fact that is reflected in the department’s three name changes, with the word “food” added in 1999. The afternoon panel discussion focused on the future, with speakers arguing that agricultural, food, and resource economists will be urgently needed in coming years. Rich Sexton, professor of agricultural economics at UC-Davis, argued that the discipline is uniquely qualified to identify and make decisions involving trade-offs among goals like food security, managing technological risk, preserving environmental quality, and achieving equitable growth. Hilary Sigman of the Rutgers Department of Economics outlined recent advances in environmental economics and public health, describing a number of clever studies (for example: flight delays in Newark cause an increase in respiratory illness in Los Angeles). Cornell’s David Just introduced attendees to the discipline’s increasing use of behavioral experiments. His own work is designed to discover techniques that cause people to make healthier food choices; the best ones involve “nudges” but not shoves. 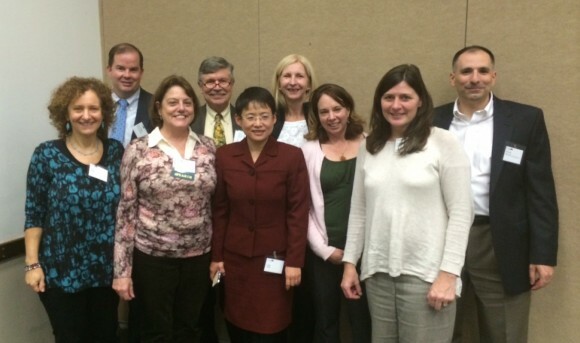 The event was attended by about 50 agricultural economics alumni, former and current faculty and staff, and guests. Executive Dean Bob Goodman opened the dinner with an overview of developments at the university and the school. Daniel Rossi and Margaret Brennan-Tonetta, alumni of the department who went on to have successful careers in SEBS administration, were featured on the program as speakers. 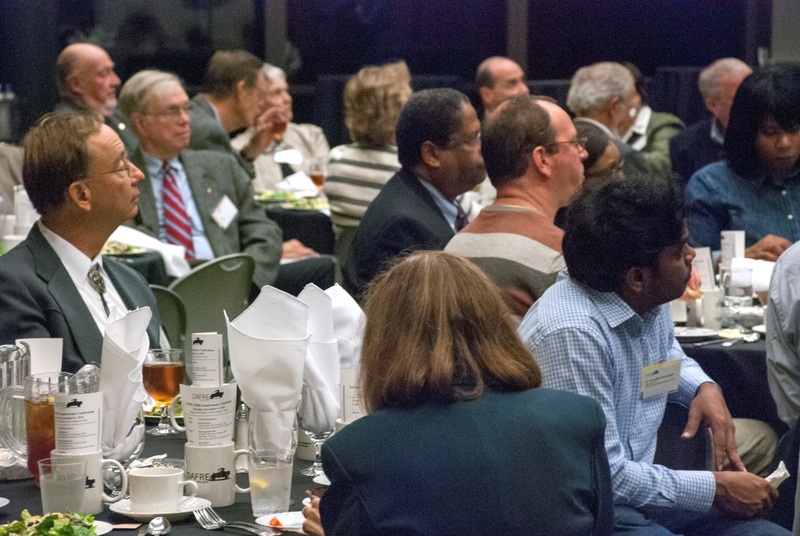 Approximately 50 agricultural economics alumni, former and current faculty and staff, and guests attended the afternoon panel discussion, which was followed by a reception and dinner.